Excellent evergreen shrub for a tall hedge. Long upright growing branches form a narrow, columnar habit. Takes well to shearing. Seacoast tolerant. Exceptional choice for sun or shade. Its arching branches display a graceful form if left un-pruned. If pruned, it becomes an attractive evergreen hedge. Works well in any landscape. 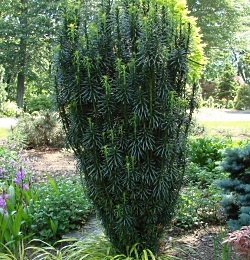 An extremely useful evergreen for sun or shade. Most commonly used for hedging purposes since it takes shearing well. Pair them up for each side of an entryway for a stately look. 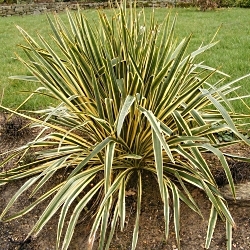 This is a smaller variety of Yucca with bright green leaves edged in creamy white. Late spring spikes of white bell shaped flowers reach 3'. 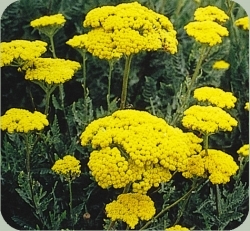 It is extremely hardy, drought-tolerant, and deer-resistant. It will create a n interesting textured statement in a garden bed or planted in containers.